Why do you need to know how to choose the best Florida health insurance agent or broker? If you are looking for health insurance in Florida, there are many considerations to be made. Part of the process of choosing a health insurance company is to find someone to help you out. Consider how important health insurance is. You want to be working with someone that you know has the experience and knowledge to guide you in the right direction. Here are some tips on how to choose the best Florida health insurance agent or broker. Many people think that an agent and a broker are the same thing when in fact they are very different. An agent typically represents one company and works exclusively for the company. An agent contracts with individual for an insurance company and gives service to the insured on behalf of the company. An agent will, of course, be able to provide information to you on behalf of their company (like Blue Cross or Humana for instance). There are some independent agents who work for a third party and therefore able to share information about several companies. A broker, on the other hand, typically represents several insurance companies and can help individuals and companies review plans from each provider. Brokers are able to actually write policies from any company they are licensed with. They will be able to give you information from each company, but they may not be as familiar with all the options as agent is. Also, there is sometimes a slightly higher cost involved in using a broker, but you have the opportunity to compare. When you are counting on someone to help you with something as important as health insurance, you want someone who is knowledgeable. When you are applying for health insurance you should be ready to ask questions. If the agent you are considering has to look up a lot of the answers, flip through a manual, or call a supervisor, they may not be as knowledgeable as you would like. Of course, some of this is necessary, but too much checking can indicate that the agent or broker has not taken the time to learn the company. If an agent or broker is a new hire there may be more fact checking than with a veteran agent. However, new hires have typically have the time and energy to put into your policies and your questions. Veteran agents have the reputation and knowledge to meet you needs as well. All agents and brokers selling in Florida must be licensed with the Florida Department of Insurance. If they aren’t licensed, walk away. 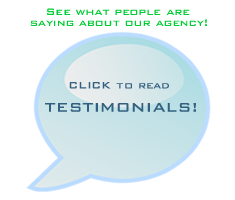 Being a licensed agent means that the Department has researched a company and found them to be financially sound. A financially sound company can meet the demands of their clients and pay any claims that arise. You are protected with a licensed agent. The Florida Department of Insurance website allows you to type in any company or any agent and see if they are licensed. Also on file is the company’s financial rating score. An independent scoring agency weighs different aspects of a company and agents to come up with a score. That score is in the form of a letter such as on a report card. Choosing a licensed agent or broker will put a layer of protection between you and the agent should something go wrong. Any broker or agent that has been working in the insurance industry for any time, should have a track record. This is especially true with access to the Internet. Doing a simple search online through a search engine should provide you with some valuable information about the agent or broker and what type of reviews they have received from other customers. You can also check the Better Business Bureau which keeps track of any complaints made by customers. These complaints are not always substantiated, so don’t let a few negative reports turn you away. There is information provided under each complaint that tells you information, how the complaint was followed up on, and what is being done about it. An independent agent works for many different companies and provides you information about each company. You can use the comparison tool on this page right now to compare information from some of the top companies. Once you have this information, you can contact one of our independent agents to answer any questions you may have. This is a good way to get some information about companies you are interested in. Also try the free FL health insurance comparison quote tool to quickly view available plans side by side!